Ethernet cables are widely used in Local Area Networks (LAN) and are much faster than common wireless adapters. Ethernet cables are a must-buy product for Esports due to a lot of reasons. Using wireless adapters is not the best way to do online gaming because a wireless connection is not reliable, has a slower response time, and often have issues such as disconnection or low signals. Ethernet cables, on the other hand, are completely free of these issues and a professional gamer always prefers a wired connection for online gaming because every millisecond counts in the competition. VANDESAIL Professional CAT8 Ethernet Cable is a high-quality cable having a bandwidth of 2-GHz and supports up to 20-Gbps transfer rate. The connectors are 24K gold-plated making the data transfer accurate and efficient. It is also available in braided design which is preferred by many people as it looks better. 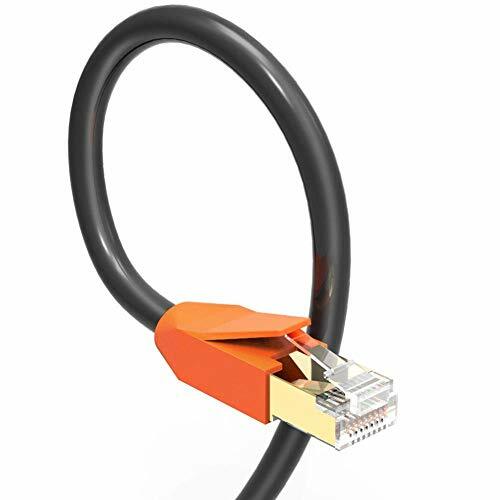 VANDESAIL Professional CAT8 Ethernet Cable comes in only black color but connectors are available in two colors; orange and black. It is also available in large sizes which can be useful if you are using the cable outdoor. We observed great transfer rates and the shielding of the cable ensured durability. It is a premium cable but comes at a cheap price and is suitable for any kind of network whether at home or in the office. Micro Connectors Cat8 SFTP cable is one of the cables you should use in a big network. It has 2-GHz bandwidth and it supports up to 40-Gbps network speed. The cable has aluminum Mylar foil on each twisted pair and all the cables are collectively shielded with 85% tin braided copper. This results in very low interference from environmental factors providing a stable connection. Before buying this cable, make sure that you confirm the length of the cable as the longest pack is only 25-ft long which I supposed might not be enough for some users. This cable was quite stiff due to extra shielding which was a bit troublesome for installation but yielded excellent results once connected. A unique advantage of this cable for a large network is that this cable has Snag-less boots which allow easy changes in the network. 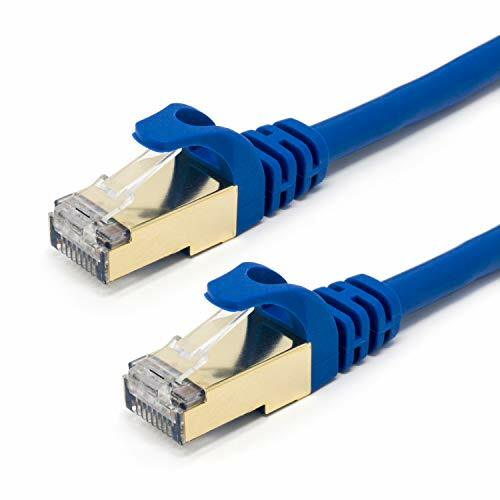 Also, the cable connectors are 50U” gold plated for accurate data transfer. Again, this cable can be used in almost any type of environment, be it an office, home or even LAN events. 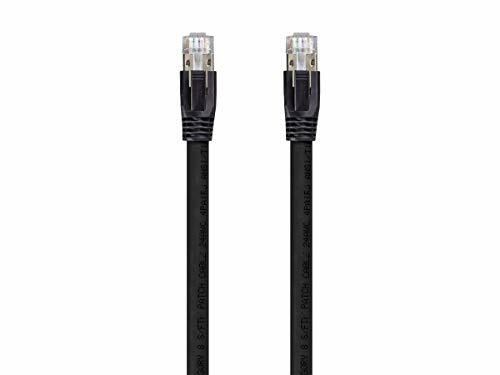 Monoprice Cat8 Ethernet Network Cable is a very attractive product for home users as it is available in lots of colors and gamers can match the color of the cable to their PC theme. The cable has 2-GHz bandwidth and 40-Gbps transfer speed. The maximum length available for buying is 50-ft which is more than enough for home use. This cable was almost similar to Micro Connectors cable in terms of stiffness and was even thicker in width. The performance depends more on the other equipment in the network but this cable provided us with improved speed nonetheless. The connectors on the cable are not gold-plated but it does not make much of a difference in terms of performance. Also, the company provides a lifetime warranty for the cable which is excellent. This is an interesting product for the people who are looking for variety in terms of colors and the overall look of the cable, mainly targeted towards streamers and PC enthusiasts who like to match their color scheme throughout their whole PC setup. 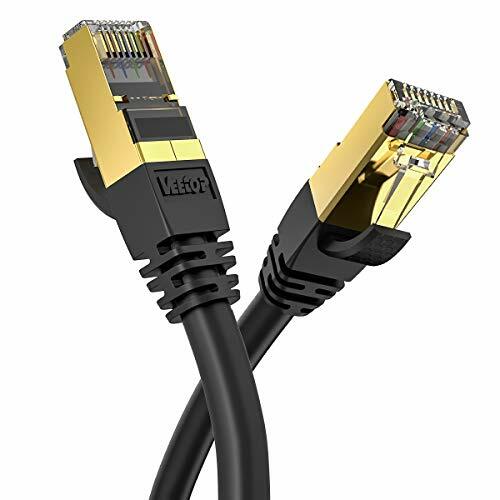 Veetop Cat8 Ethernet cable supports up to 40-Gbps transfer rates with a bandwidth of 2-GHz. It uses 100% pure copper wires to ensure efficient operation. As it belongs to Category-8, the cable is an SFTP cable which means that both the inner wiring and the outer cable are protected by foils. Also, the connectors are gold plated for accurate data transfers. This cable has the longest length in our list with 65-ft readily available to buy. Installation and removal of this cable were relatively easier thanks to the flexible push tab. The thickness was less than that of the Monoprice cable but achieved similar performance. We found this to be one of the best LAN cables we have ever seen. This cable is only available in black color with golden connectors which makes it a better-looking product than most of the others. The company provides a 2-year warranty for the cable which is enough for a small product like this. If you want a long, durable and top-notch LAN cable, then this should be on the top of your list. Buhbo CAT 8 Ethernet Cable is an SSTP cable supporting up to 2-GHz bandwidth and 40-Gbps transfer rate. 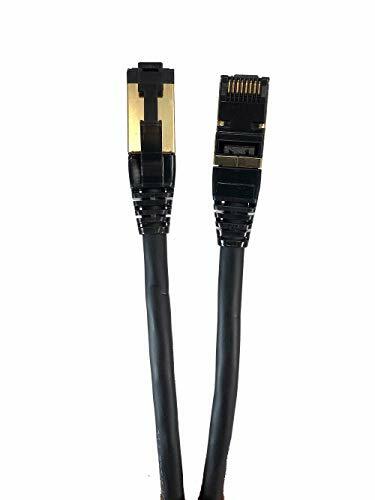 The cable uses gold-plated connectors to ensure accurate data-transfer and to avoid the connectors getting rusty. Since it is not available in long size (maximum 10-ft long), make sure that you calculate the distance between your router and your device before you buy it. As it is an SSTP cable, it provided a stable connection and first-class transfer rates. The cable is available in two colors, black/blue and comes at a very cheap price making it the best bang for the buck though it is not covered by any warranty.